This analysis can easily expose the areas of code that can be improved in terms of quality, and even better, we can integrate this analysis into the development workflow, and thus, tackle these code quality issues in the early stages of the development even before they reach the main branches. The idea is to add another stage to our Continuous Integration process, so anytime we want to merge new code in the main branch via Pull Request, our CI server (or a 3rd party service) will run this code quality analysis, setting the result into the Pull Request and making it available for the commiter and code reviewers. At this point, we could define code quality goals per project that if not met, the Pull Request is marked as “not passed”. These goals should be set and agreed by everybody involved in the development (developers, QA team, project manager…). For example, we could define that the new code has to have at least 80% of test coverage and no code quality issues, otherwise, the Pull Request is not successful (don’t get me wrong, unsuccessful doesn’t mean declined, but code reviewers should consider this analysis at the time of deciding if they approve or not the Pull Request). And all of this automated! Furthermore, this analysis introduces a point of objectiveness in the process of code review, reducing the number of comments and discussions between developers, and thus, the time spent in code review. I don’t know if it’s me but lately, when I check the Github repositories of the libraries/frameworks that we use I often see the Code Climate badge on it. It has a very friendly and usable UI. Even if you’ve never used this kind of tools, you can easily understand the different figures and charts provided. 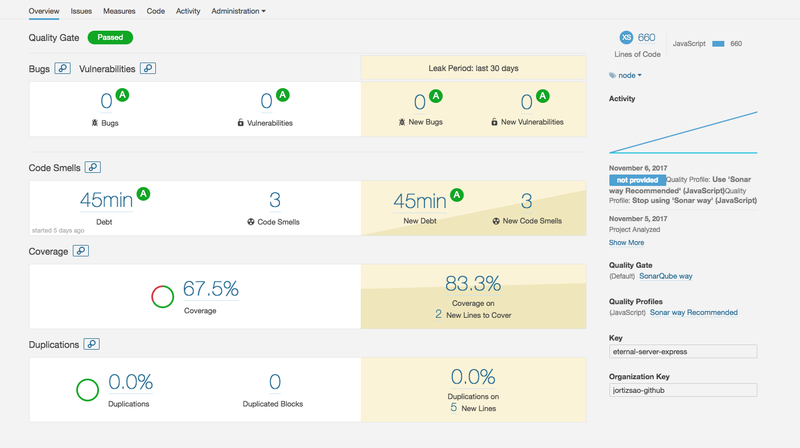 The first time you log in you can see a dashboard showing all your projects with a summary of the maintainability and test coverage per project. Test coverage is also graded from A to F based on the overall percentage. Regarding testing coverage, it displays pretty well the coverage per file and you can even sort them, so it’s easy to see which files have a poor test coverage. It also provides different charts that show the trends in your code (i.e if technical debt is increasing/decreasing, test coverage increasing/decreasing). 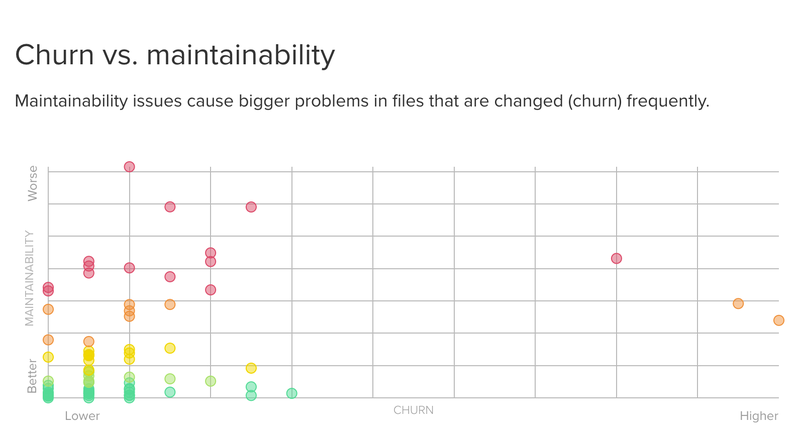 I would remark the one that crosses Maintainability against Churn (files that change frequently). The files at the top right corner, this is, files with a high technical debt with a high frequency of changes are more likely to generate bugs. It states there is an integration with several IDE/Text Editors such as Atom, Vim but I haven’t tested. One thing to point out is it doesn’t have integration with BitBucket Cloud for Pull Requests, so it would be great if the Code Climate team provides this feature in the near future. Additionally, it provides a library called cc-test-reporter for uploading your test coverage result. It’s simple and easy to use. It works like a charm. 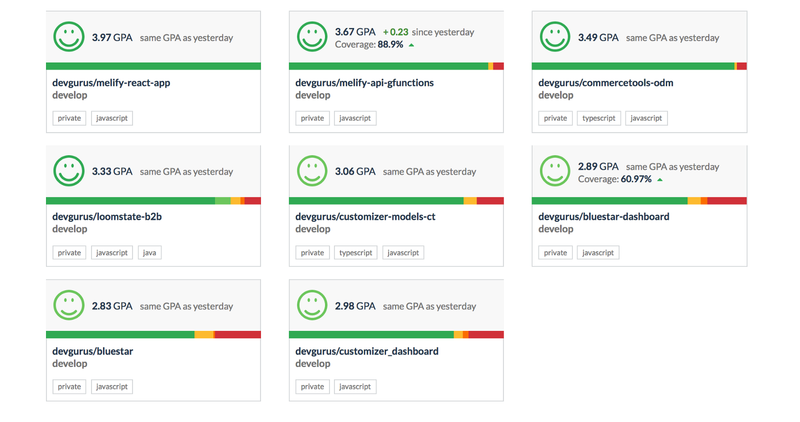 This tool takes a pretty similar approach as Codeclimate in terms of grading the projects. The main difference is that Codebeat uses a ‘4.0 scale’ system instead of A to F grades. Codebeat uses its own algorithm for analysing the complexity (Code Climate uses well-known engines instead) and I would say it works pretty well by default. The depth of block nesting which normally means very complex functions. The algorithm for duplicated code is also pretty accurate. It differentiates ‘similar’ code (same structure but different values) and ‘identical’ code (same structure and same values). One thing that I really like is the ‘Quick Wins’ section, which is a section with the top 5 issues that penalise your code quality grade, so you will likely find here a potential source of bugs/unmaintainable code. But there are also things I don’t like. The most important one is that you can’t configure the thresholds for considering a Pull Request successful or not. Basically, if there is a new complexity issue, duplication code or decrease in your test coverage, no matter to what extent, it will consider the Pull Request as failed. This feature is something that the other tools provide and would be nice if it adds it. The other drawback is that its algorithm is closed and it’s as it is, which means you can’t add more plugins nor rules. This is good if the default algorithm works fine for you, but if this is not the case, you can’t extend it. It has the best UI of all analysed tools with a very clean user interface. It’s an example of a good UX interface. Easy to find the most important information and easy to configure the main parameters. After using for a few days, you feel really comfortable with the tool and don’t get stuck looking for some needed info. You notice that the Codacy team has invested in this area. It also allows you to define goals for your projects, either per file (you want to reduce the issues number or increase the grade of a particular file) or per category (i.e improve the security), and it recommends you the steps to follow or the issues you have to tackle to accomplish these goals. Regarding Pull Requests, you can configure multiple thresholds giving the most advanced configuration you can find among these tools. It has the best integration with your VCS (i.e Github, Bitbucket or Gitlab). With this being said, what’s wrong with Codacy if it seems to have all that we need? Worth to mention it includes Hadolint for analysing your Dockerfile. 10 points here! Duplicated code analysis works pretty well but I don’t like that it’s not considered for grading your project, so it seems it doesn’t give the importance it deserves. It’s by far the most powerful code quality tool with a lot of measures and filters but that leverages a more complicated UI and configuration. It has so much information that you can easily find yourself lost between the figures and charts. 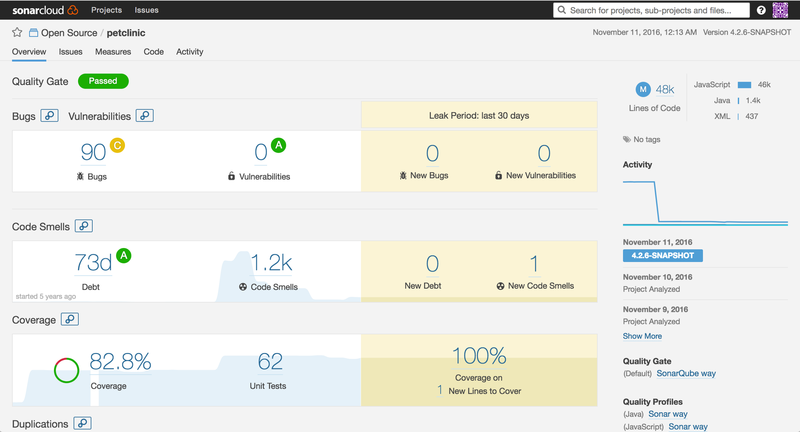 The main difference between SonarQube and the other tools is that the code analysis runs externally in your CI server and the result is sent to SonarQube. 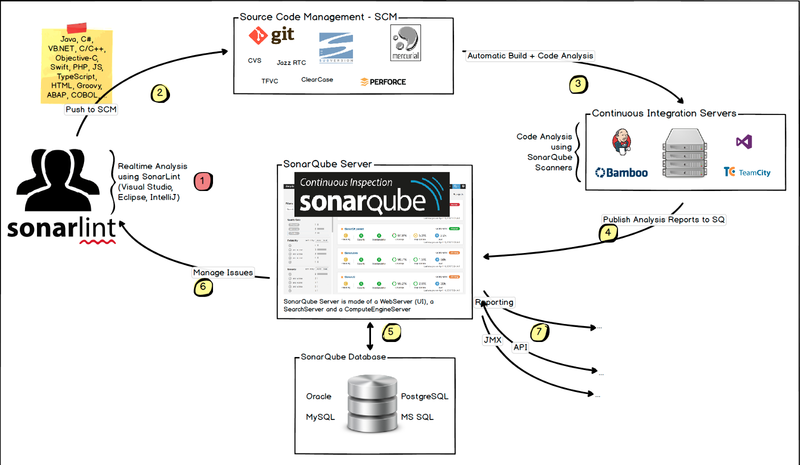 Then, this analysis is processed by SonarQube and stored in a database in order to be served. That means an extra effort in configuring your CI server. Furthermore, you can configure Quality Profiles, which is the set of rules you want to be applied in the analysis and the Quality Gates, which are the code quality thresholds. This last feature differentiates from Codacy in the way that SonarQube warns you of the unmet Quality Gates afterwards, once your code is merged and not in the Pull Request itself. 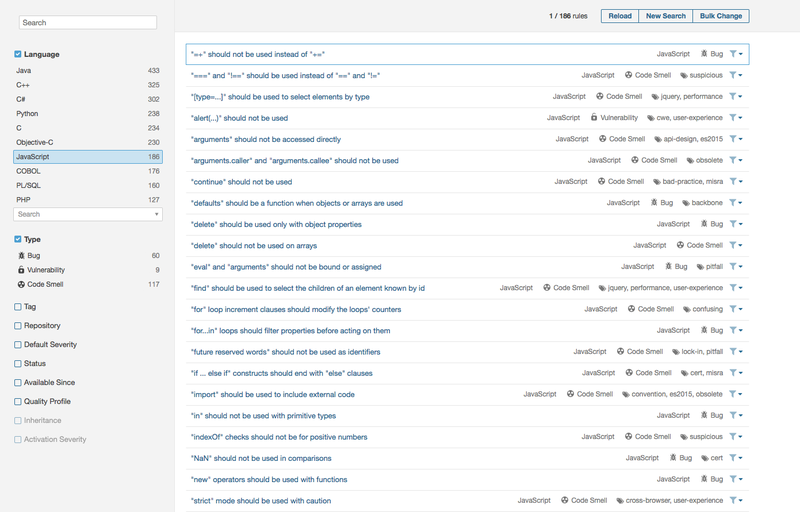 Nevertheless, the code issues found in the analysis can be added to your Pull Requests using a plugin. This plugin is something that you have to configure in your CI server, so again another extra effort over the other tools. 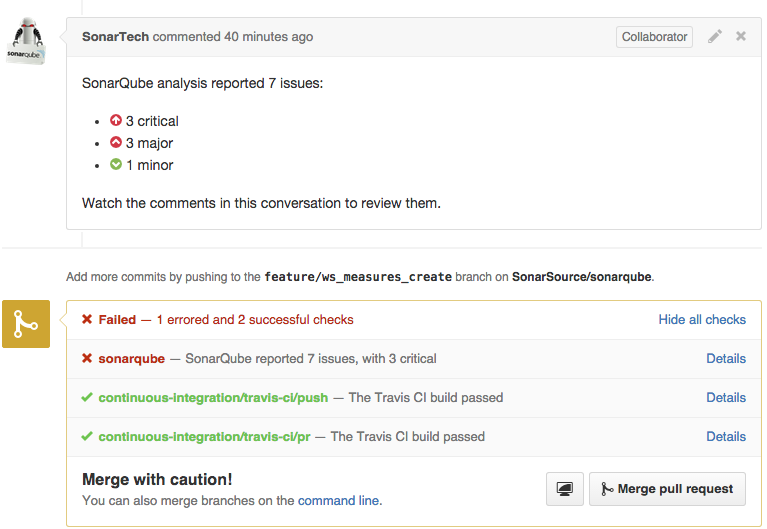 Overall perception in SonarQube is that it’s powerful but requires more effort in configuring and integrating into your workflow (although if you use Travis as CI server there is an add-on that makes this integration effortlessly). In my opinion, it should add the Quality Gates in the Pull Request stage. Doesn’t make sense to define the Quality Gates and inform you that your project doesn’t fulfil the code quality thresholds once your code is in the main branch. And finally, one point that can make SonarQube to be your choice is that you can download for free (thanks to its LGPL license) and host yourself, or you can use their cloud service called SonarCloud. Honestly, we haven’t found the perfect tool for us based on our requirements. We finally had to make a balance between pros and cons and decide which requirements were mandatory and which weren’t. The feature of providing the code analysis info in the pull request is something we really wanted because we believe in the Continuous Code Quality process. So that made us discard Code Climate since it doesn’t have this integration with BitBucket cloud (our VCS). 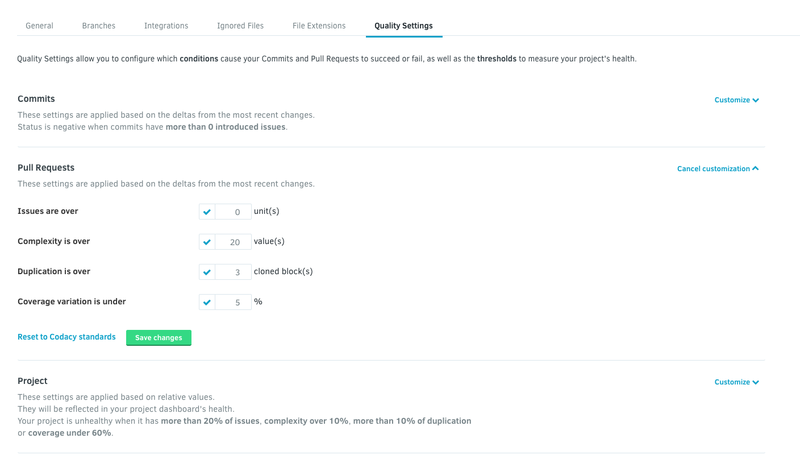 Thus, we finally ended up with two options: Codebeat and SonarQube. Neither of them has the feature we like that marks the Pull Request as unsuccessful if the defined thresholds aren’t met. 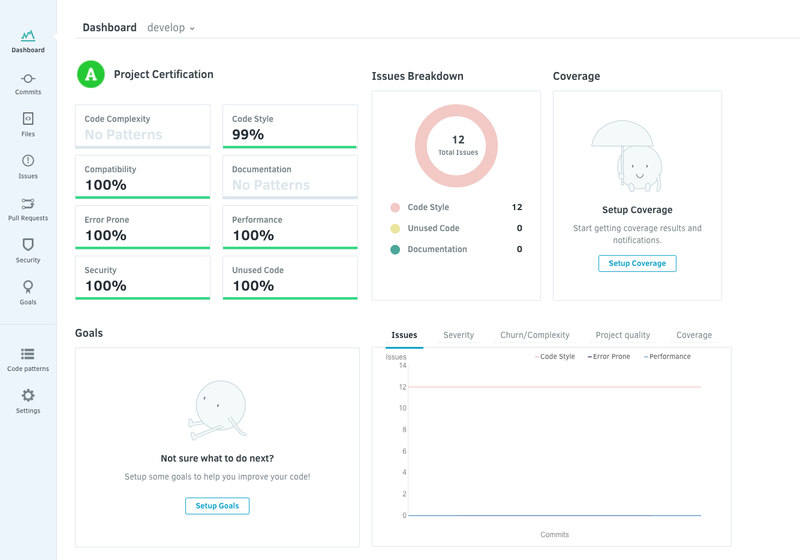 However, Codebeat gave us a very good static code analysis out of the box and we found that there wasn’t too much difference with the one provided by SonarQube. Since we didn’t want to host SonarQube ourselves (an asset for other companies but not for us), considering the time required to configure SonarQube and to integrate into Codeship (our CI server), our Devgurus QA Lead and I finally decided to move forward with Codebeat even though SonarQube would have been a good choice too. Time will say if we chose well or not. Hope this article helps you to convince yourself about the benefits of Continuous Code Quality, and if so, have a good overview of the different code review tools that exist in the market. Thanks to Ignacio Machado, Matias Páez Molina, and Maximiliano Arese. Making commerce your technological strenght.